Part of what makes modern cars so great is efficient air conditioning and heating systems, which can keep you cozy driving through the worst weather. If your heat blows cold—or on the flip-side if your A/C doesn’t—come in and let us fix it. Why suffer when the solution may be as simple as replacing a switch or recharging the A/C system? We are fully qualified to service and repair A/C systems, no matter what kind of car or truck you drive. We start by capturing the R-12 or R-134a, then we fix the issue and recharge the system for like-new performance. From a tiny leak to a faulty compressor, we can fix it. The heater uses no refrigerant, but instead relies upon the engine coolant, along with a system of hoses, valves, and fans. 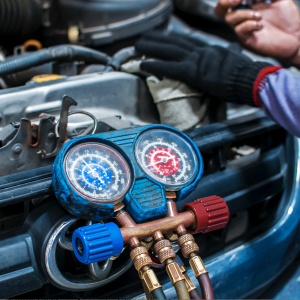 Heat or A/C that suddenly stops working can be a symptom of problem with more than the climate control, so be sure to tell your service advisor. Don’t be uncomfortable in your own car! For world-class heater and air conditioning repair please >> contact us today << — and let us make life bearable again! Velocity Auto Care, LLC strives to provide precise, high quality automotive repairs and excellent customer service for a reasonable price. We serve all of Galveston County, including Dickinson, League City, Texas City, Pearland, La Marque, Friendswood, Santa Fe, Tiki Island, Bayou Vista, Nassau Bay, Galveston City & all other surrounding areas.